When the host of “Your World” pressed EPA Administrator Scott Pruitt on his views on climate change, Pruitt dodged the question and instead spoke about President Trump’s reasons for leaving the Paris climate accords. He expressed frustration that “China and India didn’t have to take any steps with CO2 reductions until the year 2030,” before asserting that the United States was a leader in reducing carbon emissions. Regular readers of The Fact Checker may remember we gave Pruitt Four Pinocchios for this talking point on China and India, yet he trotted it out again to deflect from his position on climate change. And this time he added to the claim, citing statistics on the United States’ progress toward reducing emissions. But this new bit of spin is also misleading. (We will set aside the irony that these reductions took place under President Barack Obama.) Let’s explore. The EPA estimates CO2 made up 82 percent of all human-related greenhouse gas emissions in the United States in 2015. The primary source of the emissions is the combustion of fossil fuels — coal, natural gas and oil — for electricity generation, transportation and industrial processing. In 2015, CO2 emissions in the United States decreased 2.6 percent, following increases of 1.8 percent and 1.1 percent in 2013 and 2014, respectively, according to a 2016 report by the Netherlands Environment Assessment Agency. China and India, two of the largest carbon-dioxide emitters, in 2015 saw a 0.7 percent reduction and a 5.1 percent increase, respectively. And what about the 2000-2014 reductions? According to the EPA, since 2000 energy-related CO2 emissions in the United States have fallen 7.5 percent. So where does Pruitt get the 18 percent figure? In other words, Pruitt is picking the data metric that puts his talking point in the best possible light, even if means he is not consistently using the same metric. But he obscures that fact by failing to clarify that he’s shifting metrics. With respect to India and China, Pruitt’s claim uses total emissions reductions as a comparison point. And when it comes to the United States, Pruitt is using the per capita measure. While the 2015 reductions put the United States ahead of China and India, the numbers aren’t the best comparison. That’s because China and India are much larger than the United States. Using a per capita measure helps to normalize the emissions numbers, based on population, to account for the vast size difference. China and India both are home to more than 1.3 billion people. The U.S. population is only one-quarter of that — about 325 million. On a per capita basis, the United States produced 16.5 metric tons of CO2 in 2014, according to the World Bank. China produced 7.5 metric tons and India produced 1.7 metric tons. By this measure, the United States produced more than double the emissions of China and eight times more than India. The United States has a long way to go to bring per capita emissions in line with China and India, yet Pruitt twists this metric to make it seem as if the United States is not such a big emitter of CO2. While Pruitt highlights an overall reduction for the United States, per capita figures are best used to facilitate comparison among states. In 2014, Texas was the largest emitter of CO2, releasing more than 600 million metric tons of carbon dioxide into the atmosphere. Wyoming, in contrast, emitted under 100 million metric tons. Yet even though Texas produced six times more CO2 than Wyoming, Wyoming is the highest per capita emitter. That’s because Texas is home to 27 million people, while Wyoming has fewer than 600,000. Winters are also much colder in Wyoming than Texas, increasing the need for electricity and other fuel sources to keep warm through the cold months. Additionally, some states saw significant reductions in carbon emissions while others experienced only a minimal decrease. The average obscures whether the country’s biggest emitters saw a significant reduction in CO2 emissions, which is a more telling measure. For example, the District of Columbia produced 3.0 million metric tons of CO2 in 2014, the least of the District and the 50 states. From 2000-2014, the District’s emissions decreased 30 percent, one of the largest declines. Meanwhile, Texas produced 641 million metric tons in 2014, the largest of the 50 states. From 2000-2014, Texas reduced its emissions by just 1.6 percent. Ultimately, the data show Pruitt is overselling the reductions. We sought to clarify Pruitt’s data points with the EPA, but officials did not provide much of an explanation. When asked if Pruitt misspoke and left out the word “per capita” during the Fox interview, an EPA spokesperson reiterated the fact that he was referring to per capita emissions. Pruitt claims the United States is leading the way in reducing its carbon footprint, decreasing emissions by 18 percent from 2000-2014. But he is misrepresenting the data. The United States may have had the largest decrease in carbon emissions, but it is still one of the largest per capita emitters. And when it comes to overall carbon emissions reductions, Pruitt uses the average per capita decrease instead of the overall decrease, without actually making clear he’s talking about per capita numbers. Pruitt uses this data to bill the United States as a global leader in combating climate change — even as he’s vocal about revitalizing the coal industry, a major contributor to carbon dioxide emissions, and cutting emissions regulations. 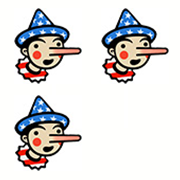 We wavered between Two and Three Pinocchios, but settled on Three. Since Pruitt’s staff refused to say he misspoke, using the per capita figure to tout an overall decrease appears to be a deliberate effort to mislead the public. during an interview on Fox News’s "Your World"